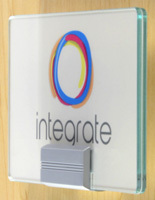 Looking for designer signage mounts to elevate the quality of your presentation? 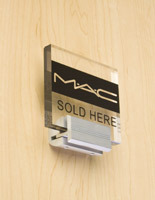 Our unique sign hardware offers modern looks with high quality construction in either steel or aluminum. 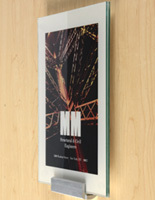 Our selection of mounts and brackets is available in two types of applications: wall or floor display. Designed with clean lines and minimal obstruction, this sign hardware puts the emphasis on what is displayed rather than calling attention to itself. After all, isn't this the purpose of signage in the first place? 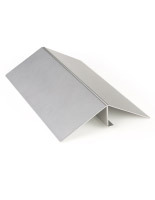 It is important to note these bases and brackets do not come with panels or boards; we only supply the sign hardware. Read on to learn more about these stylish display systems. 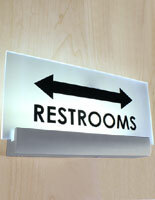 What are the different types of sign mounting accessories? 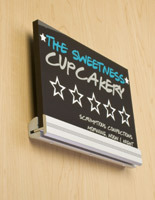 Wall-mounted sign hardware comes in two styles: standoffs and rails. 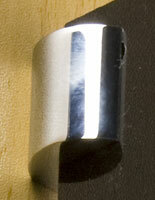 The edge grip standoffs are designed to display flag signs (that are perpendicular from the wall). 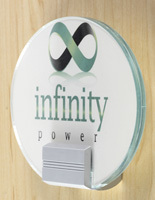 These are commonly installed in hallways so that viewers can see the signage in both directions, such as for fire extinguishers, elevators, and emergency stairs designations. The rails offer a simple way to mount wall signs with one major difference. 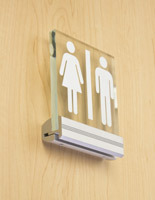 They feature an adjustable design and are able to accommodate sign panels of various thicknesses. 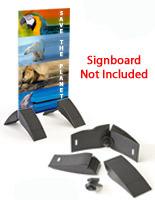 Metal bases and "feet" let you place sign boards strategically out on the floor for help with directing people, crowd control, or simple marketing tasks. 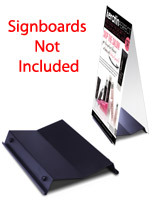 These displays are designed to support rigid sign boards between 1/4" and 1-1/2" thick. 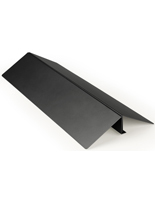 However, some models offer the ability to accept a range of thicknesses thanks to their adjustable features. The two major styles of mounts mentioned above are intended for interiors only, but there are a couple of other exterior-rated examples of hardware worth mentioning. 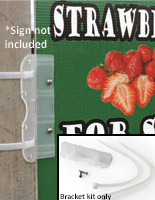 Mounting signage to outdoor posts is a common application in many industries. One of the problems installers encounter is having to deal with different post shapes, as well as mounting straight to walls. 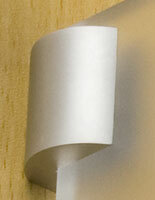 Our polypropylene bracket can be attached to round or square posts and it can also screw into flat surfaces. How's that for flexibility? 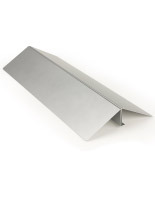 The other featured product is an aluminum hinged handle for making your own custom sidewalk signs. Just attach your sign boards to the handle for an elegant presentation that speaks volumes about your business or establishment. Now you have the tools for installing, what about the sign itself? We don't supply our mounting hardware with boards or panels, but we can offer some recommendations. 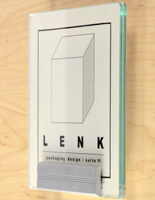 In the case of the wall standoffs that display perpendicular off the wall, opaque panels are recommended because these types of signs normally have graphics on both sides. The aluminum rails, on the other hand, are always single-sided and therefore any kind of substrate can be used. Thick clear acrylic panels are always attractive, especially when the sides are edge-polished to give them a more professional and finished appearance. In addition, since the panels are displayed off the wall, shadow and light play a big part of the overall presentation. 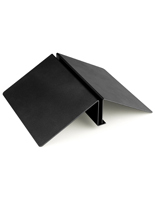 Most of the floor bases can adjust to accommodate various thicknesses of boards. The thing to consider when choosing a substrate for these stands is weight. 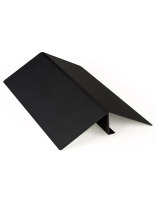 While many types of substrates can be applied, including MDF plywood, acrylic plastic, and PVC Sintra, their added weight could make the stands unstable if the overall height exceeds 5 feet. 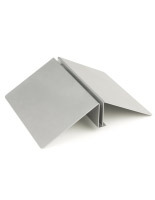 It's best go with rigid, yet lightweight panels such as Gatorfoam, Dibond, or Alumalite. 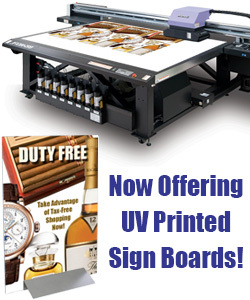 Print high-quality text and imagery right onto the surface of these materials with UV flatbed printers or opt for computer-cut vinyl sign graphics.